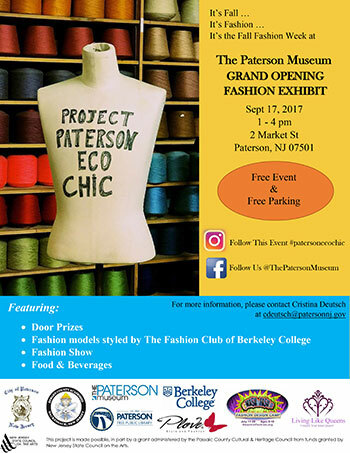 WHAT: The Paterson Museum will host an opening reception for its first eco-friendly fashion art installation, “Paterson Eco-Chic.” The exhibit will display garments made with recyclable materials donated by the City of Paterson’s manufacturing companies, including Les Metalliers Champenois, Accurate Box, Greenbaum Interiors, Feldman Brothers, and more. To celebrate the exhibit’s launch, students from the Berkeley College Fashion Club in Woodland Park will present a fashion show that reflects the silk and textile industry’s rich history in Paterson, NJ. The Fashion Club is a student-run organization that arranges events and charity initiatives to provide students ways to explore their interests in the fashion industry. The “Paterson Eco-Chic” exhibit will display the work of students, artists and award-winning designers like Victoria Pero, highlighting contemporary fashion while embracing sustainability and recycling. Click here for more information about the exhibit. This project is made possible in part by a grant administered by the Passaic County Cultural & Heritage Council from funds granted by the New Jersey State Council on the Arts. The “Paterson Eco-Chic” exhibit is curated by Cristina Deutsch, Curator of the Paterson Museum. ADMISSION: This event is free to the public, with free parking provided at the museum. Click here to register. Zachary Shaw, Senior Media Relations Associate, Berkeley College, Zachary-Shaw@berkeleycollege.edu, 973-278-5400, Ext. 1-1644, or 609-610-8362. Cristina Deutsch, Exhibit Curator, The Paterson Museum, cdeutsch@patersonnj.gov or 201-543-4085.